The farms I owned previously all had some portion of each farm in row crops growing corn, soybeans, milo in rotation, some hay ground, some CRP in either buffer strips or entire fields. And each farm also had timber producing timber products e.g. firewood, hedge posts and oak, hickory, walnut and cherry veneer logs growing in inventory. New farm has all previous row crop fields enrolled in the quail program CRP. I have planted 15 acres of food plots in the CRP so far. The Timber ground is producing timber products and I am currently working on Timber Stand Improvement Plan. Dug two ponds and stocked them on the new farm so far so add Fish to the list. And they all produced a lot of wildlife. 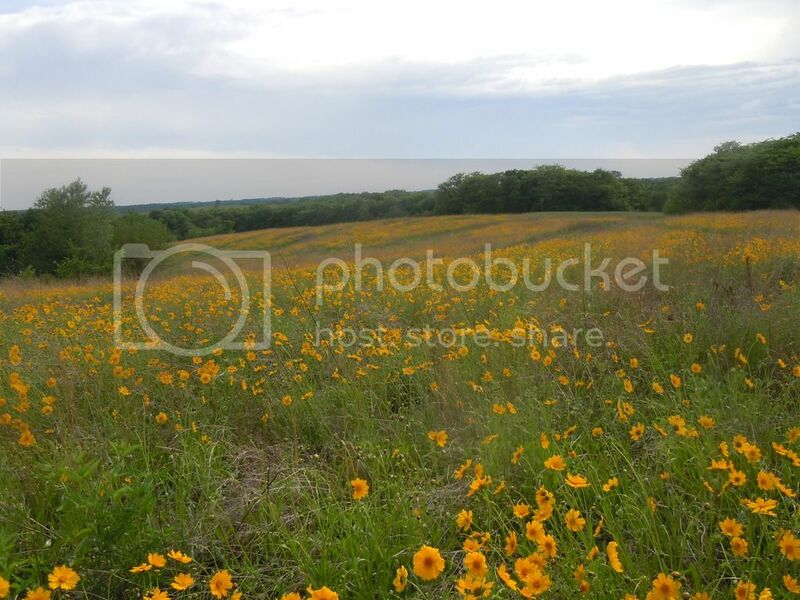 Here is one of current CRP fields last Spring. Last edited by AverageGuy on Sun Jan 22, 2017 8:09 pm, edited 2 times in total. You are right that wildlife improvements are often part of the contracts. They are considered 'added benefit' by FSA and often provide extra ranking points for awarding contracts. Farmers who are willing to do those sorts of practices are more likely to get those contracts. My point wasn't that it is not a wildlife program, just that it's not the only thing driving where we have CRP. Yes I was emphasizing why we Upland Bird Hunters would want to further their own best interests by supporting the petition. It is rare for a new contract to not have wildlife benefits in it, in part because of the reduced acreage making it more competitive to bid ground into the program. Your right Im a liar. Last edited by Kiger2 on Sun Jan 22, 2017 9:10 pm, edited 1 time in total. I wholeheartedly agree on supporting the petition. You and I are probably on opposite sides of the 100th Meridian. Your place looks great and you should be proud of it. It's anything but average. The pollinator points and programs are generally speaking a very good thing because fobs and flowers make bugs and bugs make chicks. They work really well in the wetter areas, but down here in the dry southern Plains they might come up if you get the rain at the right time and they won't if you dont. But most places have native flowers in the seedbank already and just need the right conditions to get them to come up. One of the unfortunate issues down here is the fact that a lot of the CRP was planted in exotic grasses like old world bluestem that get ridiculously thick so the stand has no bare ground. No bare ground generally means no forbs when it rains and no brood habitat. Disking, grazing, and burning are all good tools to get those forbs, increase brood habitat, promote native grasses, prevent the spread of trees and invasive shrubs, and create diversity in structure. Each of them have their plusses and minuses. I'd sure like to see FSA promote grazing and burning more as opposed to haying, and I'd like to see the penalty for prescribed grazing removed. I don't see as much wildlife benefit from haying. All that said, I think the CRP program is probably the greatest 'accidental' wildlife program ever created. It put roughly 4 million acres of grass back on the ground here in the Texas Panhandle, not including the other states. CRP is one of the reasons that the walk-in hunting programs in states like Kansas, Nebraska, and the Dakotas exist. Every hunter needs to sign that petition and support that program. I'm glad this post has grown legs and is running. Great job. SeanK, I agree with all you say. My understanding and experience is FSA has moved away from allowing mowing as a management tool and replaced it with disking and or spraying. One of the farms I sold when I moved had CRP which I had enrolled and planted originally. The first contract required/allowed mowing every other year which I did. The second contract on that same CRP ground no longer allowed mowing and in its place required disking and or spraying to suppress grass growth in areas of each field on a annual basis. I used the spraying alternative and it worked pretty well. I think disking is better and plan to use that approach on my current CRP. My quail program CRP on the new farm called for little bluestem, side oats gramma, forbs and alfalfa. Unfortunately the program does not require soil test and the PH was way too low for alfalfa to grow so that was a waste when the prior owner sowed the seed per the contract. I bought the farm tested the soil and then applied 3 tons of line to the acre. And I frosted seeded red clover and lespedeza which will grow in more acidic soil than alfalfa. Got an excellent stand of both within the grass now. We received excellent rain the first two years and my little bluestem stand is 5 foot tall, thick and rank. Fire is the next step. AverageGuy, that's some beautiful land you own. I don't own anything near that, only 3.1 acres. I'm actually (slowly) starting to improve much of it for wildlife. Not really so I can hunt them on my property but just for their benefit & so I can enjoy them on my property more. I'm mainly doing this by purchasing beneficial native seedlings from my state Game Commission's own nursery. I don't have a tractor or implements yet so I plant them by hand. I don't have a lot of spare cash at the moment so its been slow go but I keep at it. I have turkey, deer & rabbits (and foxes at night, avoiding the rath of my dog) as regular visitors and several pheasants. I've had some woodcock stopover on their migration and my first plantings were with them in mind. Right now most of it is still farmed by my local farmer but I'm getting ready to jump forward with more plantings, particularly fruit tree seedlings. I gotta get ahold of the farmer to inform him of my plans. This has been a good thread and I'm glad too that it picked up steam. Sounds like a wonderful project Ryan. I got my start in habitat improvement when my Wife and I bought a very run down 25 year old 1500 sq foot 3 bedroom ranch on a crawl space sitting on a wonderful 40 acres. We lived there and commuted to our jobs in the city for 26 years. Bought a tiny used 18 hp 3 cylinder diesel Ford Tractor, a used one bottom plow and a used 5 foot disk. Ordered sawtooth oaks seedlings from NWTF and planted them in tubes all around the place. Cleared a 2 acre field in the river bottom by hand with a 16 inch chainsaw, and plowed the roots with the little tractor and the one bottom plow. Grew corn, milo and clover in the field over the years using an antique 2 row planter I bought and rehabbed. Took my first whitetail and turkey with a bow around that field and my first P&Y buck. Watched a moma bobcat followed by her 3 kittens stroll the entire length of that food plot in the bright sunshine one early fall evening while sitting in a tree stand. Raised and trained my first Vdog while living there. There is little to no CRP here in Georgia. Wonder why that is? Bigearl wrote: There is little to no CRP here in Georgia. Wonder why that is? A key criteria is HEL - Highly Erodible Land. The central purpose is to take HEL out of crop production and put it into permanent grass which will then stop the soil erosion, improve water quality and provide enhanced wildlife habitat. In MO and IA you can find HEL all around and thus a lot of land which would be better off not in crop production. If most of the crop production ground in GA is flat it really does not benefit much from enrolling it into CRP. But I don't know much about your State. Thanks AG, most of my neighbors actually have larger parcels surrounding me. It's all a mix of agricultural fields, weedy fallow fields & woodlots with nice wooded ridge running behind my house, so even though my parcel is small I have lots of critters moving thru daily. Plus I have some seasonal springs and wet areas too. In fact my ag field has a low area that forms a nice seasonal water hole and my plan is to enhance this into a wetland area for the wildlife. 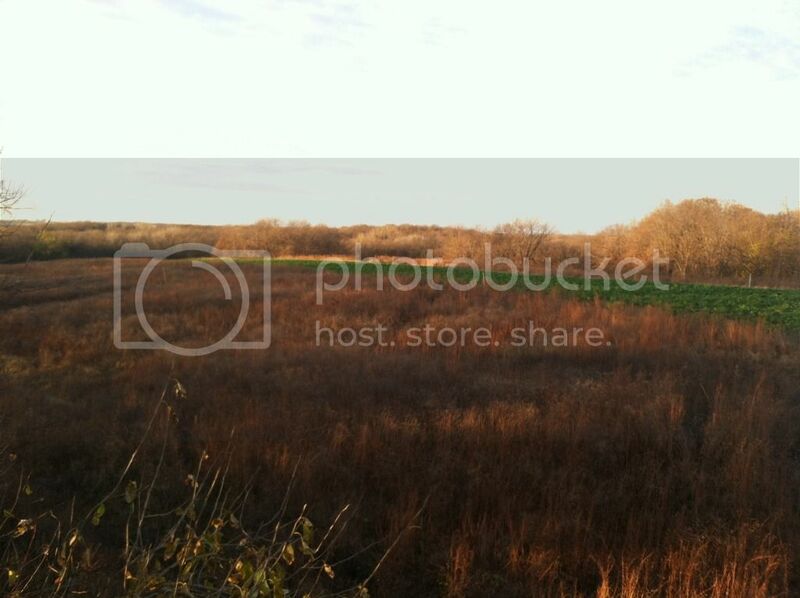 M first winter here I shot a 6 pointer out back 200yds from my house. Highlights of critters seen have been a large bear, coyotes and I too even had a bobcat come across the field, once. Yesterday I had 11 tom turkeys walk right down thru my front yard with my dog sitting on the porch steps barely 10yds away quietly watching them!